Finally the bloody show came on 10th April morning when I woke up in the morning. I was 39w+3d and was ready to pop anytime that week. My estimated due date was 14th April 2013 by the way. Gavin was such a good boy, listening to mummy. Everyday I was talking to him telling him if he wanted to come out, he could do so from Wednesday onwards (10th April onwards) because I still went to work on Monday and Tuesday (8th and 9th). And he really came out on the 10th! I went to the toilet at 6.45am in the morning with light red mucous-like blood on my pantist. Hubby has sent Kz to the nanny that time and when he came back, I said 'I think its time, I have blood on my pantist'. My hospital bag has been packed and off we went to the hospital. Of course we had breakfast first before going to the hospital as my gynae's clinic only opens at 9am. I had chee cheong fun and iced milo at a coffeeshop nearby the hospital. Went to the hospital, gynae came, checked and I was dilated 2.5cm. Registered for admission and started me on drip around 10.30am. The nurses slowly increased the drip and soon enough I was feeling the contractions. My water bag broke after about two hours on drip. Long story cut short, I was 6cm dilated by 12pm. By that time the contractions were getting more close and frequent and not to mention more PAINFUL as this time round, I opted for no painkillers! With Kz, I opted for the pathedine injection. It made me drowsy so this time round, I vowed not to have any painkillers. Labour this time round was very painful and each time the contractions came, I felt like dying and my mind was thinking 'just push me to the ceaser room'. But I still endured because I know I will have to push anytime soon as I was already 7-8cm dilated. But when the contractions went away I felt fine for 1 minute. And then it happened again. The cycle goes on and I just felt like dying. The midwife was not helping much and I could still remember her name and the awful things she talked about in the labour room. Finally I felt like I had to push and I shouted for my gynae. He arrived in a jiffy and I was so relieved to see him. He prepared himself and asked me to push. At that moment everyone in the labor room was asking me to push (1 midwife, my gynae, 3 assistant nurses, my hubby) and I waited for the next contraction to help me push. After 3 pushes, baby was out! With Kz I only had to push once, maybe because I took the Pathedine, so it helped to relax my muscles (according to the nurse), but I still go for: No Painkillers! 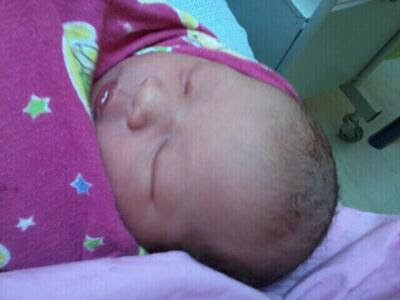 This time, labour took only about 4 hours, but double the pain compared to Kz's time with 8 hours labour. Anyway, here's baby Gavin after birth. Welcome to the world baby boy!